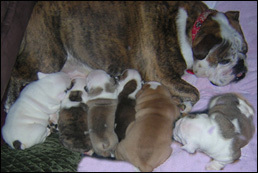 Mimi has six new English Bulldog babies! Anyone who raises English Bulldogs knows that it’s not always easy to get a pregnancy and a healthy litter of these precious cuties! Mimi was bred twice in the past but didn’t get pregnant. Her owners had given up hope of Mimi ever having puppies until their veterinarian referred them to Dr. Vanderlip. Mimi traveled the long distance to see Dr. Vanderlip for consultation, help, ovulation timing, and artificial insemination (which Dr. Vanderlip performed non-surgically). The happy results were six healthy, live puppies! Congratulations to the Phillips and “Mimi”!